In Texas, patio weather can definitely extend into December, and all that heavy holiday fare can start to weigh on you. 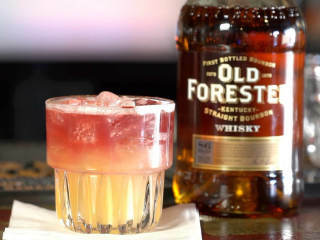 That's why Dallas bartender Julie Campbell is mixing up the light and refreshing New York Sour for this episode of Old Forester's Cocktail Chronicles. Follow the simple recipe below, and watch how Campbell gets the pretty finishing touch just right in the video. Combine bourbon, simple syrup, and fresh lemon juice in a mixing glass. Shake well, then strain over ice. Pour red wine over an upturned bar spoon and enjoy.